Last month Netcom supported Nina, one of our clients daughters, to travel to Africa to work in a school in Du Noon for 2 weeks. Nina dropped me and email last week so i thought id share. It was a pleasure Nina! I just wanted to let you know about what we did while in South Africa. 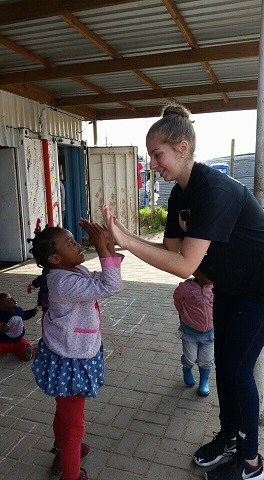 We were volunteering at a school which is located in Du Noon, where we helped to make the outside of the school which was a shipping container bright and colourful for the children to make their time there more fun and happy place, while at the school we also taught the children how to play hopscotch. It amazes me how the children have nothing yet they are the happiest children I’ve ever met and it was a real eye opener being with people who are less fortunate. In the back of the school we planted some fruit trees and built a key hole garden where we planted different vegetables. Thank you for helping me on my way to be able to go to Africa,I really appreciate it.